Bergans is a long established Norwegian Outdoor brand with a long tradition as an equipment supplier for expeditions. Not having any first-hand experience of their products, I was very interested in trying out the Glittertind, a waterproof shell. The Glittertind is from a Bergans' range which uses the Dermizax™ fabric - in this case in a 3 layer construction. The fabric has a relatively soft feel but does rustle somewhat. It's a relatively long-length jacket and I found that the overall fit was very true to size; for me, a bonus was that the sleeves are a really generous length covering virtually the whole of my hand. I don't believe I have particularly short arms so I assume this is a feature - which I'll certainly appreciate in the rain particularly as the temperature drops. The generous, peaked hood plus faceguard provide great protection although I did have a minor issue with the hood in that it does tend to slip forward. Although I've not managed to find a way to adjust it to sit in an ideal position for me, I tend to wear a hat which sorts this out. There is plenty of room for this - in fact the hood is spacious enough to accommodate a helmet if necessary. There are five pockets; outside are two breast pockets plus two at the side front, inside there is one zipped pocket. The external side pockets are located relatively high and so are easily accessible when wearing a backpack .. and - joy of joy - are just about big enough to hold a folded OS map. In use I found the Glittertind to be very comfortable. The freedom of movement in the shoulder areas is excellent. 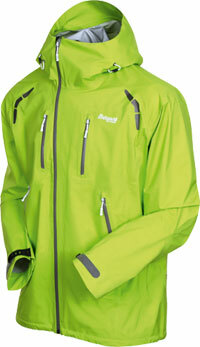 I've worn it in a variety of UK Autumnal wind and rain combinations and it's certainly waterproof and windproof. I do 'run hot' so am a good test for a fabric's breathability. So far I think the Glittertind's Dermizax 3 layer to be similarly breathable to the various standard Goretex products I've worn. Where the Glittertind does excel is in the variety of features that allow you to adjust your temperature on the go notably the really very large large pit zips and the mesh pocket linings. The Glittertind is a shell and so designed to be used as part of a layering system. That having been said, it does trap a layer of air and so far I have been using it with with just a baselayer (mid October). On perhaps a more stylistic note, the main front zip is slightly off centre which I quite like; it's perhaps slightly more comfortable when the jacket is fully zipped than the usual 'zip at your mouth' situation. So far the fabric durability looks to be very good. There appears to be some reinforcement around the shoulders and at the bottom front where a backpack's shoulder straps and belt sit. The overall finish looks to be of a very high standard. Lightweight and eminently packable, the Glittertind is a versatile, attractive and reliable shell to wear on its own in warmer weather or with a mid layer in colder conditions. Yes - it's a premium product but an investment worth considering if you're a year round walker.